Evolution is going to revolutionize your next family vacation. Not only is there a specific children’s bedroom, but there’s also games and activities throughout the house that kids will love. The main gathering spaces are all open and have walls of glass doors facing the deck, so you can keep an eye on everyone wherever you are. Speaking of the deck, it’s huge! There’s a long lap pool, two dining verandas, and a beach just a step below the deck. Take the kayaks off the boat dock to explore the picturesque coastline, or drive over to one of the four beaches that are all a half hour or less away. Open floor plan with ocean views from every bedroom! Evolution is a serene, beachfront villa on Grand Cayman’s South Sound. Families and couples will love this fully air-conditioned villa’s chic interiors, massive terrace, and private boat dock. The terrace borders a private sliver of South Sound’s beach, and is lined with loungers for guests to sunbathe, nap, and read in. Verandas one either side of the pool shades al fresco dining tables, and the outdoor kitchen sits around the corner for guests to grill and mix drinks with ease. 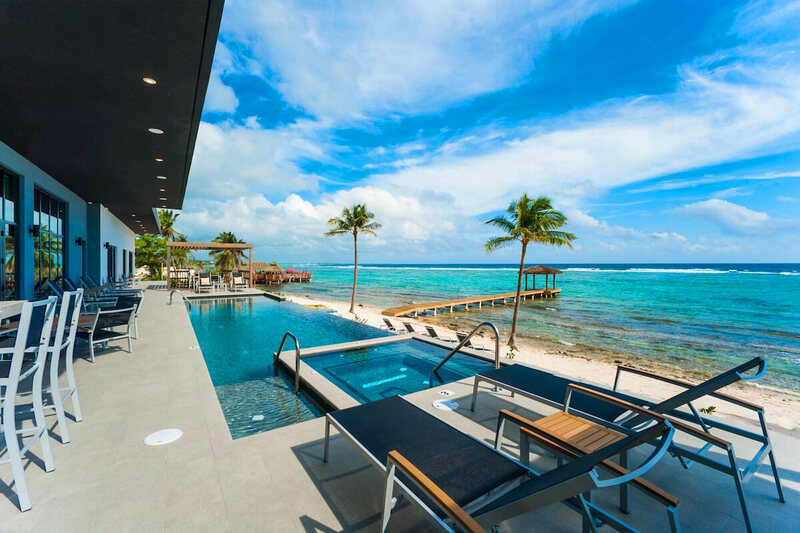 The infinity pool is long enough to swim laps in, and there’s a hot tub for kids and adults to soak in. There’s also a bathroom just off the pool deck, which is an invaluable addition to the already impressive outdoor space. Down on the beach, loungers sit in the sand and kayaks lay near the boat dock. A step inside the villa leads to the Great Room, which incorporates the living room, dining table, and modern kitchen. Movie nights are easy in the oversized sectional facing the flatscreen TV, and there’s plenty of seating to lounge in. Everyone can eat around the reclaimed wood dining table and enjoy the ocean view through the wall of sliding glass doors. The kitchen stretches across the width of the villa, with stainless steel appliances and a sleek bar top/prep counter. Evolution has two spacious master suites, each with a king-sized bed, ensuite bathroom, and access to the pool deck. Four cozy queen suites with Apple TVs and ensuite bathrooms sit around the Great Room. The seventh bedroom is great for kids, with two full bunks and exterior access. Instead of an ensuite bathroom, the kid’s bathroom can be accessed through the Great Room. Evolution is in Bodden Town, which is home to local culture and an ideal location between Rum Point, Cayman Kai, and East End. Each of these are 15-25 minutes away, and Seven Mile Beach is only a half hour away. Located on 250 ft. of beachfront access. When first entering the beach there is soft turtle grass on shoreline. The soft sandy bottom begins at 100 yard from shore.